India: Lodhi Garden in Delhi- tombs and blooms. 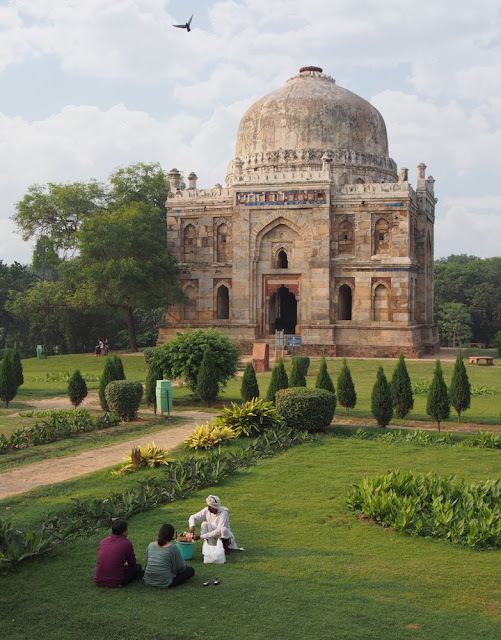 There are two excellent reasons to visit Lodhi Gardens. First of all the greenery- a few days among Delhi's 20 million inhabitants are enough to make you wish for some green space and tranquility- and Lodhi Gardens is just the ticket. And second, its history. A succession of pre-Mughal royals chose this spot as a nice place to push up the daisies, and their tombs, offering a rare glimpse of pre-Mughal indian architecture, still stand, making the Lodhi Gardens a cemetery, public park and open-air museum all wrapped up in one. At the southern edge of Lutyens's New Delhi, west of Humayun's tomb. Map. 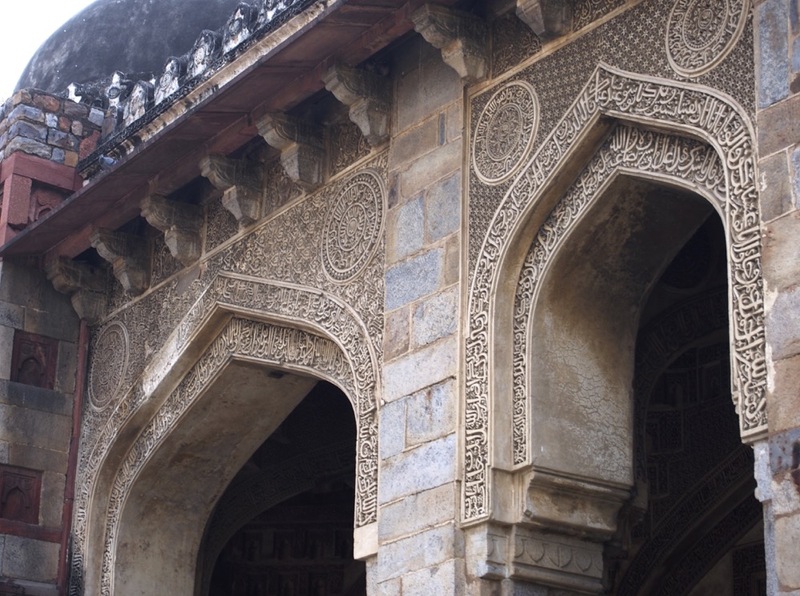 OF COURSE, IT'S the Mughals who have the edge when it comes to building tombs. 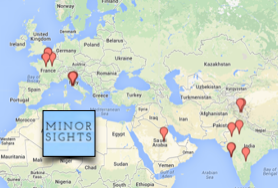 Case in point: Agra's Taj Mahal and, located in Delhi itself, the tomb of emperor Humayun. 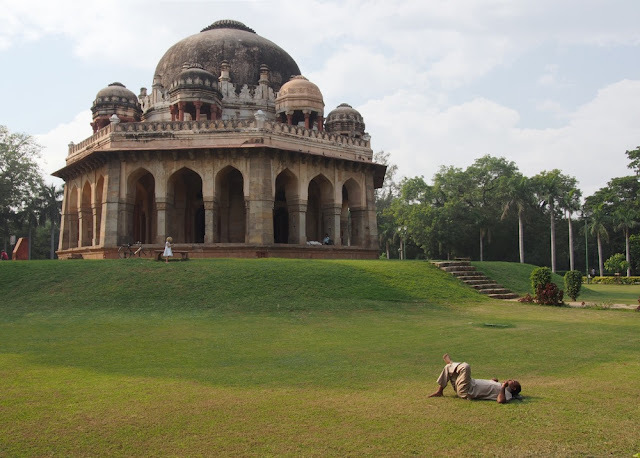 Lodhi Garden is a great place for naps, too. 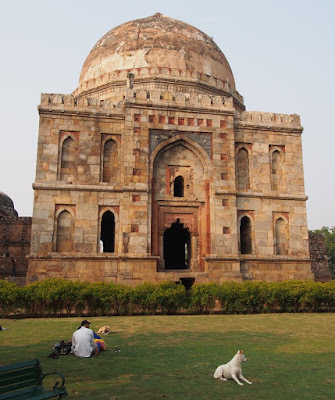 But there were tomb-building royals in India before the Mughals marched in from Central Asia, and once you start looking, you'll find Delhi is littered with crumbling tombs in various states of decay. 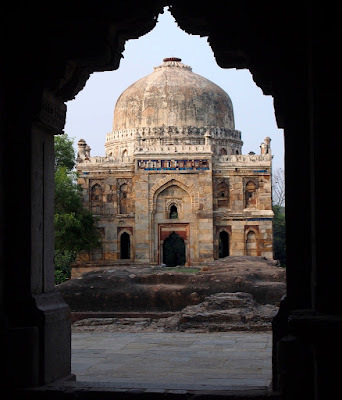 But the best place to go tomb-spotting (it sounds more macabre that it is) is Lodhi Garden (or Lodi Gardens, or Lodi Garden: Indians rarely agree on anything, least of all on how to transliterate from Hindi). 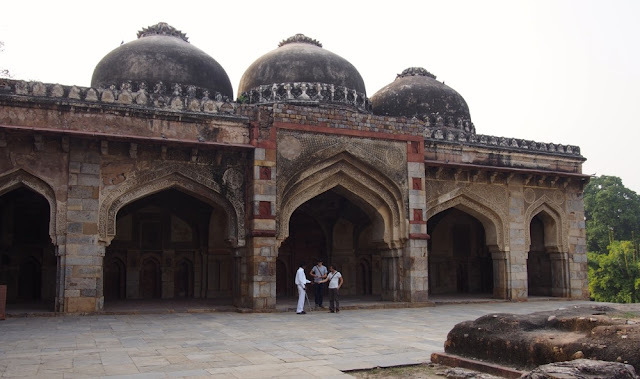 During the Delhi Sultanate (13th to 15th century), at some point somebody had the bright idea to bury the recently deceased ruler, Muhammad Shah (1434-1443) in a nice spot in what was back then the rural countryside, just outside the capital. 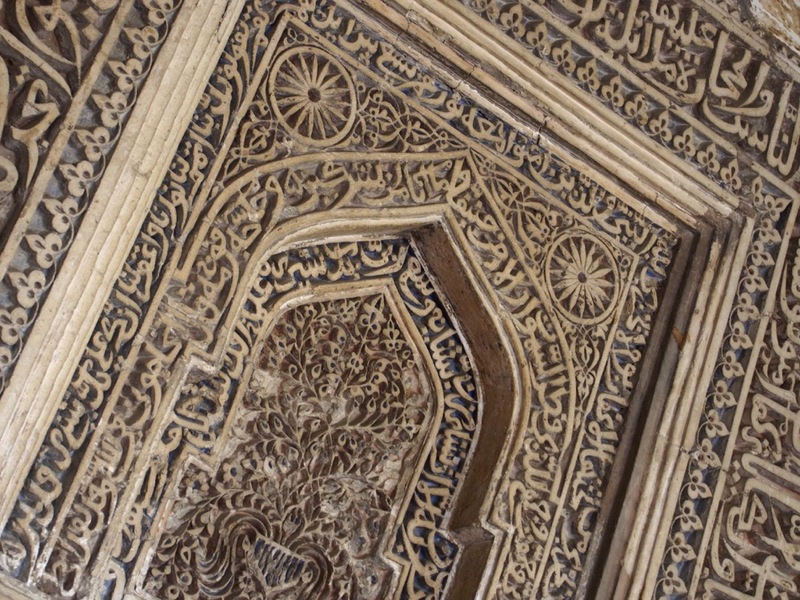 This started a trend, and subsequently a number of Sultans and assorted hangers-on were buried here, mostly from the family of illegal Afghan immigrants that seized the throne shortly after Muhammad's demise, the Lodhi dynasty. By the time another group of illegal immigrants, the British, seized complete control of Delhi in 1857, the area had become a settlement: huts and two small villages had sprung up between the tombs (which offered free shade and shelter). The British were having none of it and, with ruthless colonial efficiency, cleared the area in the 1930s, forcibly resettling the villagers and creating these formal gardens. Chaat-wallah in front of the Shisha Gumbad. With a typical British penchant for gardening, the wife of the British viceroy, Mrs Willingdon, took charge of the landscaping and when the garden was opened in 1936 it was christened, without any pretense of false modesty, 'Lady Willingdon Park'. Having finally booted out the Britishers in 1947, the Indians did the right thing and scrapped the colonial name, naming the park for the Lodhi dynasty whose monuments form the core of this green space. Bara Gumbad is flanked by the Friday Mosque (nothing to do with Robin Crusoe; this is where the pious came to pray on Fridays) which is decorated with some spectacular carved plasterwork. Thank God it's Friday, Mosque. The garden offers more than just tombs- the lawns are perfect for picnics (provided you find some shade) and there's even a rose garden and various other blooming plants. A great way to spend a few hours after sightseeing in Delhi's frenzied Old City. You may want to avoid Lodhi Garden at the weekend. Although it's peaceful during the week (witness the pictures above), the weekends can bring our masses of lovey-dovey couples looking for a quiet place to snog and extended families taking a stroll. Plan accordingly. Take a virtual walk through Lodhi Garden with the kind people of Delhi Heritage Walks. Thanks Rasal! Have you been? Thank you! always nice to hear! 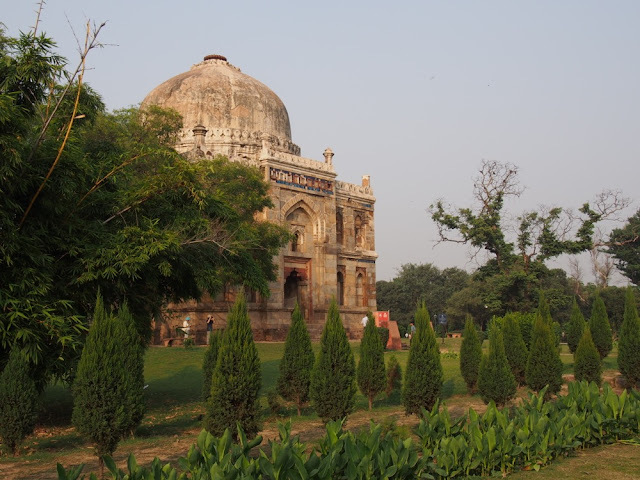 All the Details which you mentioned about Lodhi garden - Delhi will be very helpful for the travellers who visit it. I totally agree for that and would like to contribute further to the users who are now reading this article. I have written an article on "Unique things to do in Delhi" as well which covers the end to end that matters in Delhi - unique Places at http://www.travelwithshama.com/delhi/ and I strongly believe it will provide more information about the Uniqueness of Delhi. Anyways, that's an amazing post. Keep up the great work.